Since the title of the play was ‘Nothing Like Lear’ (produced by The Company Theatre and Cinematograph Production), I had decided to brush up on my Shakespeare and revised that King Lear in ancient Britain had three daughters. The first two, when asked, gushed that he was precious and super, flattered him, etc. while the third said she loved him as a daughter should. This latter’s sincere heartfelt statement did not go down well with the king. He banished her, and she died in exile. In time, he was also disgusted with the other two who were insincere, selfish and conniving. When he was without kingdom, they abandoned him, and so on and so forth, with sub plots. But the title of the play was Nothing Like Lear. 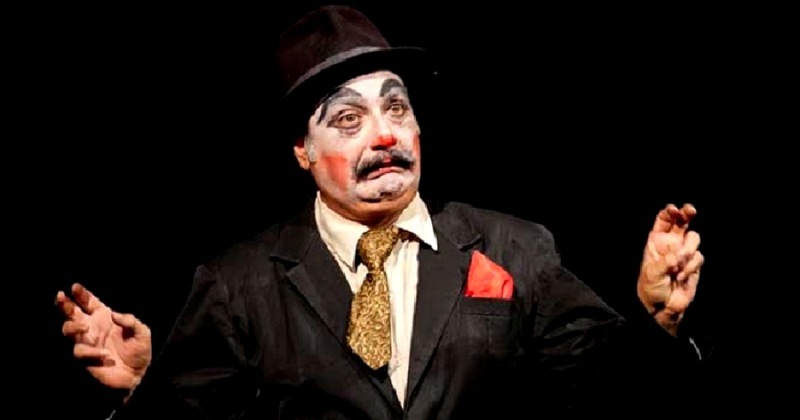 This 90 minute tragicomedy tour de force by Bollywood and stage actor Vinay Pathak, wearing a big red bulbous nose, portrayed a depressed clown as King Lear whose daughter has left him. The theme was that dynamics of father-daughter relationships may have changed since those ancient times, but essentially, the core is the same. A single man on a bare stage – there were no props, no set – emoting for 90 minutes held the full house at Ranga Shankara in thrall that Saturday afternoon. Never a muffed line, plenty of ad libbing, and depending on audience interaction to take things forward – it was a successful effort to make Shakespeare relevant for the younger generation. His friend, collaborator and director Rajat Kapur has used clowns to make Shakespeare relevant for today’s generation by re-interpreting four of the bard’s works for the stage. Vinay Pathak often made fun of Rajat Kapur, as he did me, sitting in the audience. Making eye contact with me, he asked me to laugh (without reason), and I stared at him but sat deadpan. He pointed to my daughter and said: ”Wake him up.” Thus goaded, I cackled like a laughing hyena. The way he trashed the chap in the audience who had his mobile ring was hilarious. The relevance of father-daughter relationship since King Lear’s times and today was woven in such zany ways, with outstanding lighting and tableaus of tragedy. Shakespeare plays used to have ribaldry and slapstick, and Vinay Pathak did those, too. There were expletives and four letter words, and good natured ribbing of the audience. He took off his pants once and in view was his underwear, with Batman emblazoned s on the drawers. “Bat-man, batman, uhh a cricketer heads a neighbouring country” he said, and that bit brought yet another roar of laughter. A consummate actor, he portrayed anger, frustration, conspiracy, humour and sadness in equal measure. He switched from a sad clown King Lear lamenting his daughter’s betrayal, to Vinay Pathak interacting with the audience. And he did it with ease. At one point, he said next to Bombay, he loves Bangalore audiences. He had performed here ten years ago, when he was younger. His throw of voice then was such that he was performing at Ranga Shankara and the applause came from Chowdiah Hall. But now he was getting old and missing his (King Lear’s) daughter who had left him. The chirpy, agile, acting often with leaps and bounds and hoopla were evidence that he wasn’t getting old. The 90 minute mono acting was without an interval. I had gone to his third performance that Saturday afternoon and reflected that this veteran actor would do this again for the evening show. And then again. Whew! Somewhere he has been quoted to say that on the theme of love between father and daughter, their falling out is relevant to this day. He said he was happy that there have been many moments when daughters have approached him and said they will speak to their fathers.